Nicola Stevens represented the Western Bulldogs in the AFL Women's exhibition series before joining Collingwood. Photo: AFL Images. Collingwood’s women’s AFL team has selected Nicola Stevens with its first selection (No. 6 overall) in the National Draft. 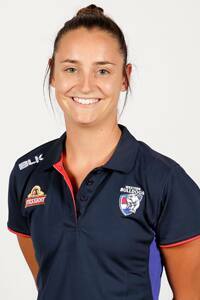 Stevens is a key defender who played with Melbourne University in women’s VFL last season. She is an excellent reader of the play, with intercept marks her specialty, and is a very good user of the ball. Hailing from Pascoe Vale, Stevens represented the Western Bulldogs in the women’s exhibition matches, where she impressed the Collingwood coaches. Stevens is studying to be an osteopath and away from footy she enjoys water skiing and basketball. Coach Wayne Siekman says: We are absolutely delighted to select Nic with our first selection in the women's draft. She is the best defender in the draft and she can play multiple roles down there for us. She is a very damaging player off half back that will give us plenty of run and drive and also can play on a key forward and lock down. One of her biggest strengths is her ability to read the ball in the air and take intercept marks.